We want beautiful weather, colorful leaves and for fall to last a long, long time before it lets winter slide in. This is the fall banner I stitched for the church many years ago. Hung it at Lourdes yesterday. The side panel with the churches I found as a fat quarter in Halifax and thought the fall themed churches were cute but did not know how I would use it. This is how stash is built. A friend gave me a piece of her scrap fabric with leaves on it ...and a banner was born. Several years ago I was asked to create a banner for a local gardening club. They were hosting a provincial conference and wanted a banner which could be hung at conferences for their annual events. It was to be a travelling banner onto which the host club name could be recorded and they wanted it to reflect their activities. Leaves are added each year indicating the convention location. I included a supply of leaves which the local host could label and attach. I had not seen the banner for many years. Because it would travel to many homes and have many owners I stitched a travel bag with a pocket and a pool noodle for comfort. When you create you often do not see how well things age. 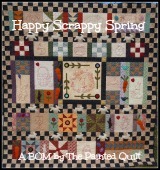 This did pretty good but if I did another one I would do more quilting. I am not fond of the wrinkled look but I guess if you live in a tube you cannot complain. The leaves falling from the flower worked well and the clubs were able to add their names. Normally I invite readers to pour a cuppa and sew but maybe today you should pour a cuppa and plant.